Nintendo President: Wii U Supply Chain is "Solid"
Nintendo of America President Reggie Fils-Aime says the company has learned its lesson from the launch of the Wii. Remember back in the late two-thousand-aughts, when the Nintendo Wii was joyfully stomping the guts out of the Xbox and PlayStation? There were riots in the streets in those dark days, as good moms and responsible dads fought it out with knives, broken bottles and chunks of wood with nails driven through them over the rare few Wii boxes that appeared on store shelves. The aisles of Best Buy ran red with the blood of the innocent, while The Reginald sat with his fingers templed, a grimly satisfied smile curling his thin, sinister lips. But there'll be none of that sort of nonsense this time around! Fils-Aime told Forbes that Nintendo has learned its lesson from the Wii (and the DS, and the 3DS) and that this time, it's got a handle on things. "Our supply chain is solid," he said. "My expectation is that we will do a phenomenal job helping the consumer understand the benefits of Wii U, and that our retailers will do a wonderful job of merchandising the product and getting it into consumers' hands. We want to satisfy all of the demand that's out there. That's our goal." One of the obvious risks for Nintendo is that the supply will hold up because consumers won't go nuts for the Wii U the way they did with the original Wii. It will also be in the rather unusual position of being more expensive than either the Xbox 360 or the PlayStation 3 when it launches, despite those consoles having reputations as being more "serious" gaming rigs. 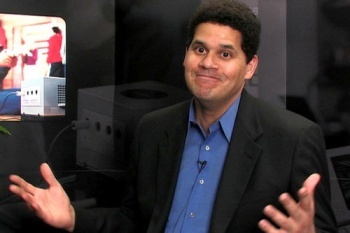 But much like it did with the Wii, Fils-Aime said Nintendo is aiming for "different consumers" with its new platform. "Nintendo will be speaking to the active consumer looking for the latest in a gaming experience," he said. "But we're also going to be speaking to a much broader mass market consumer with games like Nintendo Land and new Super Mario Brothers U, as well as the innovative Nintendo TVii." Those with a long memory might recall that Fils-Aime said essentially the same thing about the Wii in September 2007; two months later he was denying that Nintendo had cooked up a "supply conspiracy" in order to crank up the demand. It's great to talk about solid supply chains, in other words, but when the Wii U launches on November 18, smart shoppers will head to the mall with a shiv in their sock.